Earliest archived photograph of SCP-3649. Special Containment Procedures: Project SKYSCRAPER-31 is to develop methods for the penetration of SCP-3649. Project SKYSCRAPER-32 is to determine the feasibility of alternative means of terrestrial evacuation. Project SKYSCRAPER-33 is to devise a broad range of social preservation and containment contingency plans for the failure of all other SKYSCRAPER projects. 19 iterations of SCP-3649 Special Containment Procedures have been archived and hidden. 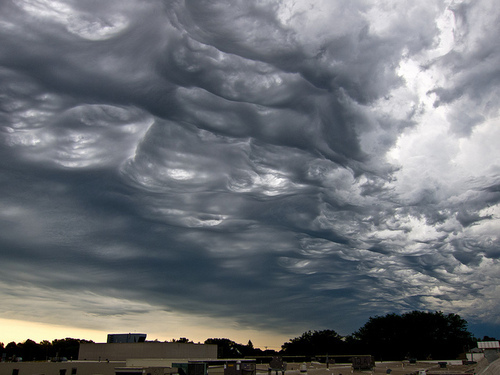 Description: SCP-3649 is an altostratus undulatus cloud formation that maintains a static position relative to the Earth's surface. All electromagnetic waves and physical matter that pass through SCP-3649 are disrupted to varying extents, ranging from general degradation of radio signals to complete collapse of molecular structures. Collisions between SCP-3649 and mundane clouds result in the former subsuming the mass of the latter.1 Certain types of clouds motivate notably larger growth than others following this integration process (cumulonimbus variants in particular.) No precipitation has been recorded originating from within SCP-3649. 1. via a type-4 Hoffman-Ritz process. See: Kassovitz, Lily, Jr. "Aerovores and Itinerant Storms: Adjusting Classifications of Anomalous Nephology." Foundation Internal Journal of Meteorology 75, no. 1 (January 13, 2020): 355-391.